Home » Japanese Knotweed » Japanese knotweed – What’s in a Name!? Japanese knotweed – What’s in a Name!? Japanese knotweed has often caused confusion, not only by being mistaken for other plants, such as Russian vine or bindweed, but also by having so many different names. This confusion exists not only with the local names of the plant in the UK and around the world, but also with the Latin name. In the UK the preferred common name is Japanese knotweed and its preferred Latin name is Fallopia japonica. Fallopia Japonica was independently classed as Reynoutria japonica by Houttuyn in 1777 and as Polygonum cuspidatum by Philipp Franz von Siebold and Joseph Gerhard Zuccarini (Siebold & Zucc.) in 1846. However, it wasn’t until the early part of the twentieth century that scientist realised that these were in fact the same plant. 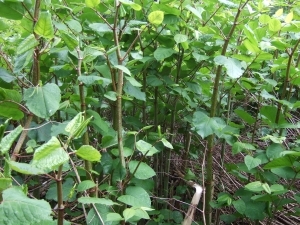 Japanese and American authors still often refer to Japanese knotweed as Polygonum cuspidatum. In the UK the common name has also varied significantly, and has included: ‘Hancock’s curse’, rumoured to be named after a plant supplier; ‘German sausage’ believed to refer to the characteristic dots on the stems; and ‘pea-shooter plant’, believed to be coined by children who used the hollow, cut stems as pea-shooters. Other English names have included, ‘donkey rhubarb’, ‘gypsy rhubarb’, and ‘Sally rhubarb’; most likely due to the fact that it tastes a bit like rhubarb. In America the common names have also varied and have included ‘elephant-ear bamboo’, ‘fleece flower’, ‘Japanese bamboo’, ‘Japanese fleece flower’, ‘Mexican bamboo’ and ‘wild rhubarb’. Around the world Japanese knotweed has had local names such as: ‘Parkside’ in Sweden; ‘Asiatic knotweed’ in New Zealand; ‘Huzhang’ in China; and, of course, ‘Itadori’ in Japan.